At the conclusion of the recent Kings and Queens doubles tournament in China, one thing should be very clear… China will soon (perhaps in 7-10 years) become a pre-eminent chess power in the world. With the support of the government, combination of talent, strong work ethic, unselfishness and intense training methods, the world's most populous nation has continued to make immense progress in the past two decades. Liu Wenzhe makes a credible case in his book, Chinese School of Chess, and details the history of international chess in China (including his historic win over Jan Hein Donner at the 1978 Olympiad). One can say that due to China's ancient tradition of playing Xiang Qi (Chinese Chess) that a favorable environment has been created that no other country can boast. 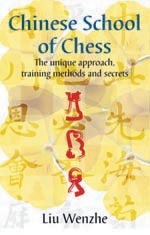 The book also examines military philosophy of Sun Tzu and its relation to the Chinese School of Chess. Apart from the above reasons for China's emergence, perhaps the biggest aid to the country's meteoric rise is the fact that the federation has actively organized a number of competitive tournaments including the world's top players. The novelty tournaments such as the U.S. vs. China Summit and the recent Kings and Queens tournaments demonstrate the creative element in organization. Regardless of talent and resources, if there is poor organization and an absence of capable arbiters, then talent cannot be properly harnessed. Women's chess in China has perhaps made the biggest impression with many international successes including two consecutive Olympiad titles, two World Champions (GMs Xie Jun and Zhu Chen), Xu Yuhua's back-to-back victories in the FIDE World Cup, and 18-year old Zhao Xue's 11-1 performance at the Bled Olympiad. WGM Wang Lei, a star player of past women's teams, once told me that chess is considered a game for the youth in China and that there are many more stars rising in schools around the vast country. 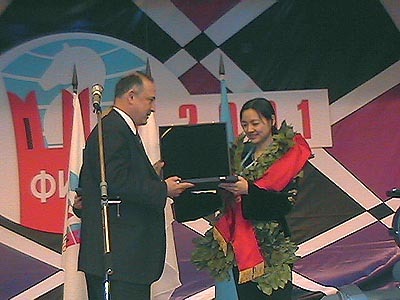 Zhu Chen after winning the FIDE Women's World Championship in 2001. New in Chess is increasingly running stories on the successes of Chinese players. In addition to GM Zhang Zhong's splendid 11-2 performance in 2003 Wijk aan Zee "B" (NIC: 2003, No. 2), there was another article showing that there is more to come. In NIC 2002, No. 6, Dirk Jan ten Geuzendam interviewed GM Bu Xiangzhi, who once held the age record for earning the GM title. One of the most interesting points in the interview illustrated the camaraderie between the Chinese youth. "We come from different parts of the country and the team spirit is very important. That's our basis to improve. All the youngsters on the national team are really good friends." On the next page was a picture of six young Chinese players sitting together at the close of the 2002 Shanghai New Bund Garden Cup. All appeared to have an air of disarming confidence. Absent is the fierce individualistic gains and intense rivalries which can stunt development and growth. This plague is seen in countries of all sizes and strengths. Because of traditional collectivist mindset, the Chinese will rise as one… and that will be soon.